The scarves are SUPER soft jersey on one side and equally soft lace on the other. I could totally wrap mine twice, but since I was going for more of a "summery" look I opted to leave it long. Sidenote: I feel like my hair is bordering on too long. I'm thinking summer cut. We'll see. Our scarves our by Chicken Scratch'd and here are the other outfit details in case you're curious. Griffin's dress is by TEA and I can't find it anywhere.... but while I was looking I came across this super cute romper by the same brand :) Her shoes are Livie and Luca petals and her headband is an XL crinkle flower from Jameson Monroe. My denim jacket is THIS ONE from Zappos, my dress is THIS ONE from Hippie Chick (seriously - I am kind of a maxi expert and this one is FANTASTIC!!! Lots of stretch and really great fabric. The top is REALLY well made. LOVE IT!!!) and you can find my earrings HERE. Val also sent me these super cute necklaces and headbands. Unfortunately, my plans for cute necklace pics were foiled by an uncooperative G, but trust me - they're ADORABLE!!! You can enter to win your VERY OWN CUSTOM Mommy and Me set! Val will talk with you and you can pick out exactly what you want! How fun is that??? Also - I ran down to Anthropologie on the weekend (shoutout to LOGAN who was so so so sweet - she works at Anthro and recognized me and was just about the sweetest thing EVER! Thanks so much for reading, Logan!!) and they were having some FANTASTIC sales!!! Anthro shipping can be RIDICULOUS, but I can justify it when I'm getting items at more than half off. I picked up this buttondown (we're all ignoring the crummy dressing room pics.... I seriously need some pointers from Sheaffer!) and immediately loved the super lightweight feel, collar and cuff detailing and the pretty colors. I'm a sucker for unique detailing and the back sold me. Dave things this floral shirt looks like a Grandma.... but I thought it was super fun! It sold out today (boo!!! ), but you should totally head to your local store and see if they have some! And this cute sweater, cardi thing that honestly, I'll probably wear paired with the Matilda Jane pants I have on in the picture for work in the Fall. 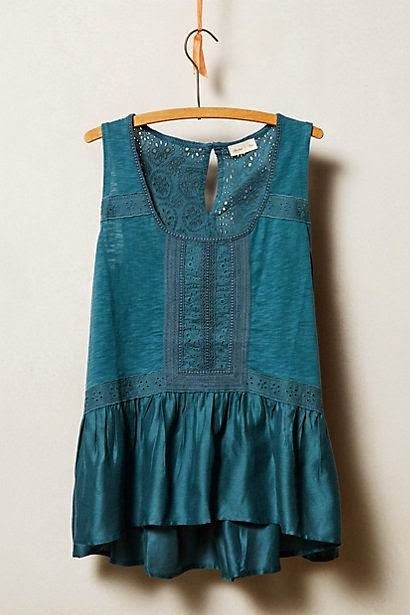 I also picked up this lace peplum tank in olive and rose... but now seeing it here in the aqua color I really want it too. I have issues. I'm totally going to steal that tweed jacket! I looooooooove it! And I also love you and G with your scarves! I can already picture Griffin wearing lots of layers and fun scarves when she's older. As for your summer cut, you should do it! I love a good summer cut! The matching scarves are so cute! I also love your new plaid Anthro shirt and the neon moto jacket- great picks!! Super cute scarves, necklaces and headband!! Love the pics of you and G! :) All the Anthro finds are awesome! Super cute scarves, necklaces, and headband!! Love the pics of you and G ( the calculator part is precious ). Lots of cuteness on the blg today!!! I love your style....so colorful! Yes!! The back of the flannel would sell me too! Looooove it. And a tweed moto jacket?? Ah I'm in love! Griffin is the cutest little girl ever! Love that mommy and me stuff!! And it's so funny -- right before I read you said your hair was really long in my head I was thinking "Oh my goodness, I've never realized how long her hair was! I wonder if she's ever had it shorter!" so that was pretty funny! But I am curious now if you've had it shorter before -- I can't imagine it not how I've seen it in your pictures! Gorgeous pictures with a gorgeous little girl! Love the mommy and me items!! And looove the neon jacket!! OH my, gorgeous pictures with a gorgeous little girl!! I love the mommy and me items!! And I think I want to steal the neon jacket too!! Andrea -love your blog and IG pics and captions!!! I think you would look great with a summer cut! Go for it! Love the tweed jacket from Anthro! And those necklaces are gorgeous! Love reading your blog every morning. Your family is so sweet! Love the scarves for little girls!!!! Such cuteness little G is! All of this is AWESOME! HM and I would love to coordinate!! Love your blog! The Mommy and me necklaces are adorable! Love the scarves, they are adorable. Your Anthro finds are all awesome, I'm slightly jealous! I enjoy reading your blog every morning as I sip my coffee and mentally prepare for the day! Thanks so much! Those pics of you and G are too funny and cute! Love the matchy-matchy things! I need a girl ASAP! lol! And that neon tweed jacket is awesome! I need it NOW! That tunic and that tweed moto jacket are perfection, I really want them both like right NOW!!!! I would LOVE a Mommy & Me set for myself and Sawyer!!! P.S. I have fallen IN LOVE with that floral top and cardi!!! Everything's adorable and the pictures of Little Miss are always my fav!!! Love the matching scarves and necklaces. Love the scarves & cute matching necklaces! Would love, love to win something Mommy & Me for myself and my 19-mo old daughter! Thanks, Andrea!!! Love all the clothes. Awesome picks! Me and my girl would LOVE to win a matching look! Scarf on a baby! Adorable! I was in Anthro over the weekend & wanted to buy SO. MANY. THINGS. It was all adorable & I could've spent a paycheck in there. That neon tweed jacket is amazing...LOVE it!!! Kids are so funny, G is super cute still in her little scarf. I need to work on my selfie outfit pics too, Sheaffer makes it look so easy! I love your style! Always dressed so cute. You need to give yourself more credit for the selfies, you look adorable! Love those clothes. I just found your blog and I love your style! My daughter is four and just asked me for her very own scarf this weekend - she has been stealing mine to wear to church! love that stretchy leopard headband on you! and the scarves are adorable. I wonder if my mini would wear one...? I'm doing a summer cut this week! Your hair is so pretty though! I think the mommy and baby stuff is too cute! I'm going to be in McKinney next week. Where are some fun junk/flea/ funky stores? Your hair --- I can't even!!! So beautiful.,if you do cut it, maybe you can donate it? Would love to win the giveaway - thanks for the chance! Love this post and this giveaway! Sooooo fun! Oh and that moto jacket! AMAZING! This stuff is so cute! Would love to win! Love this!! So cute! Would love to win!! I love seeing G's outfits! They are so cute! I have 2 little girls who I love to dress up also! I would love to win a Mommy and Me set! I have a 16 month old daughter and I would just DIE if we won! Haha! P.S. Your hair is absolutely stunning! Love they way you style yourself! Love your Anthro picks. And for the record, your selfies are just fine...I prefer real pictures to overly staged ones every day.